This chapter describes how to enter and leave BASIC, and how command mode works while within BASIC. BASIC V is supplied with both RISC OS 2.00 and RISC OS 3. Press Return, and the BASIC V version and memory option will be displayed on the screen. BASIC can also be started in both RISC OS 2.00 and RISC OS 3 from the New Task option on the Task Manager or from the command line (press F12). BASIC VI is supplied with RISC OS 3 only. BBC BASIC VI is different to BBC BASIC V in that it is stored on disc, not in the computer's ROM. BASIC VI is also known as BASIC64. BASIC VI is used by some applications (for example SciCalc) so it may get loaded into memory without you having to take any special action. Press Return, and the BASIC VI version and memory option will be displayed on the screen. then either you have not seen a !System directory, in which case you should open a directory display on the directory containing your !System, or your !System does not contain a copy of BASIC64. If you don't have BASIC64, you should update it from the !System on the applications discs. BASIC can also be started from the New task option on the Task manager menu or from the command line (press F12). BASIC files saved from both BASIC V and BASIC VI are the same and can be run using either BASIC. To leave BASIC, type QUIT, then press Return twice to get back to the desktop. PRINT is an example of a keyword which the computer recognises. It instructs the computer to display on the screen whatever follows the PRINT statement enclosed in quotation marks. Keywords are always written in upper case letters (capitals). This is an error message. It indicates that the computer cannot obey your command because it does not follow the rules of BASIC (in this case because the computer could not find a second quotation mark). In this case, because the sum was not enclosed in quotation marks, the computer performed the calculation and displayed the result. nothing obvious happens. Nevertheless, the computer now knows about the existence of a variable called FRED which has the value 12. A variable is a name which can have different values assigned to it. It is described in more detail later in this manual. the computer responds by displaying the number 4. The MODE command sets up the computer to produce high resolution graphics (640 by 256 dots in 16 colours). It also clears the screen. 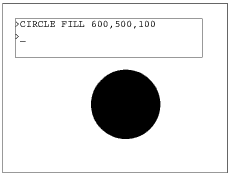 The CIRCLE FILL command tells the computer to draw a circle at a position 600 dots across from the left of the screen and 500 dots up from the bottom. This is near the centre of the screen because the screen is 1280 units across and 1024 units high. The third number tells the computer how big the circle should be, in this case giving a radius of 100 dots.